The house stands in the footprint of a former garage that served Bruton with petrol and repair services. It sits alongside an old bacon factory that has been converted into flats. 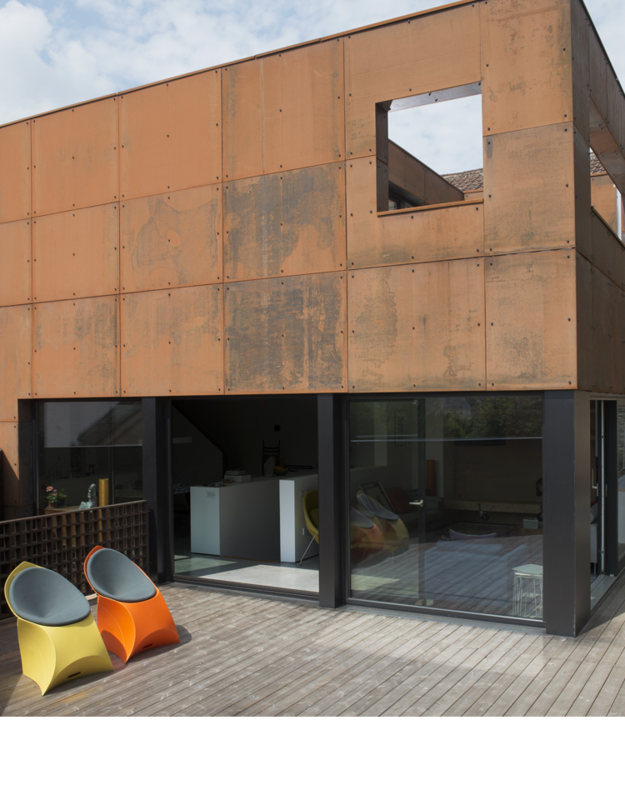 The design consists of a SIPs construction with timber cladding on the ground floor and Corten steel cladding on the 1st and 2nd floors.. Corten steel was chosen to echo the industrial heritage of the site while sitting comfortably with the stone of the old factory wall on the eastern boundary of the site. The house presents as a steel cube, which encases the upper two floors, is set back from the road and sits on top of the charred timber-clad ground floor, the footprint of which extends across the site from west to east. This has the effect of the cube appearing as though it is perched on the timber base, a sense enhanced by projecting the northern end of the building over the front entrance.